This is the first book in the “DNA Detectives” series. They are the first ever children's fiction books where the children in the story use DNA and forensic science to solve a crime. The DNA Detectives – To Catch A Thief is the first book in the “DNA Detectives” series. The story is based on a famous five style adventure where the characters use DNA to solve a crime. 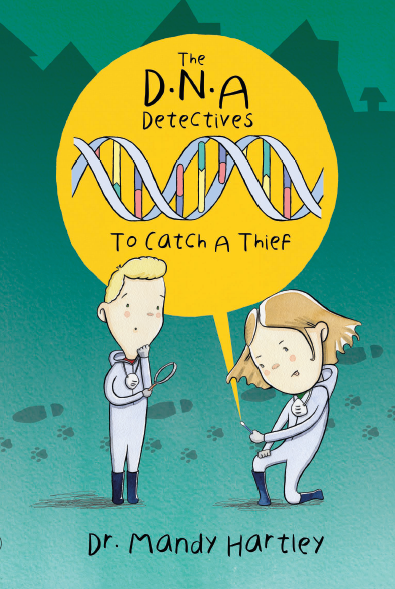 In addition to the exciting storyline readers will learn about DNA, cells and forensic science. Mandy Hartley lives in Norfolk with her husband, two children Annabelle, 11yrs, and Harry, 8yrs, and dog Milly. She has a PhD in Genetics and worked for 15 years in various different laboratories using DNA to study subjects as diverse as populations of fish at the genetic level, detecting inherited human diseases, criminal work and paternity and relationship testing. She now runs science workshops to teach children as young as 4 years old about DNA and performs stories to explain difficult scientific concepts such as evolution, natural selection and inheritance to children.